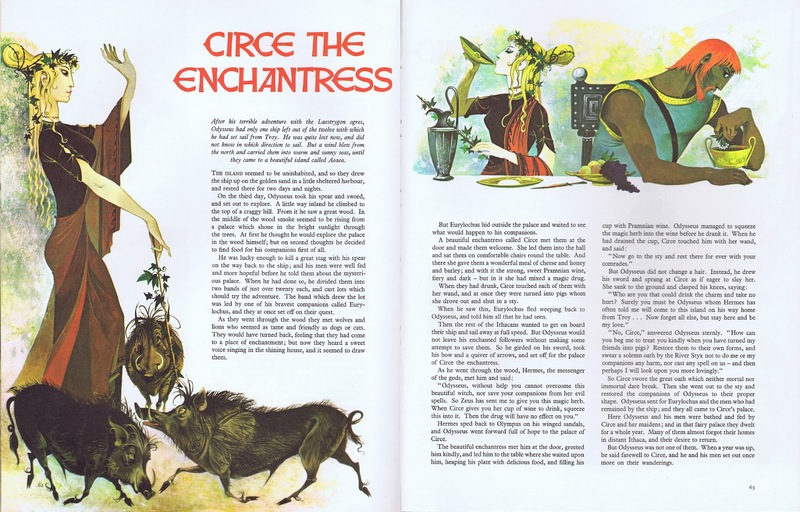 The year was 1963 and in the small bookstore come stationer that was one of my favorite childhood haunts, there was a new book that immediately grabbed my attention. 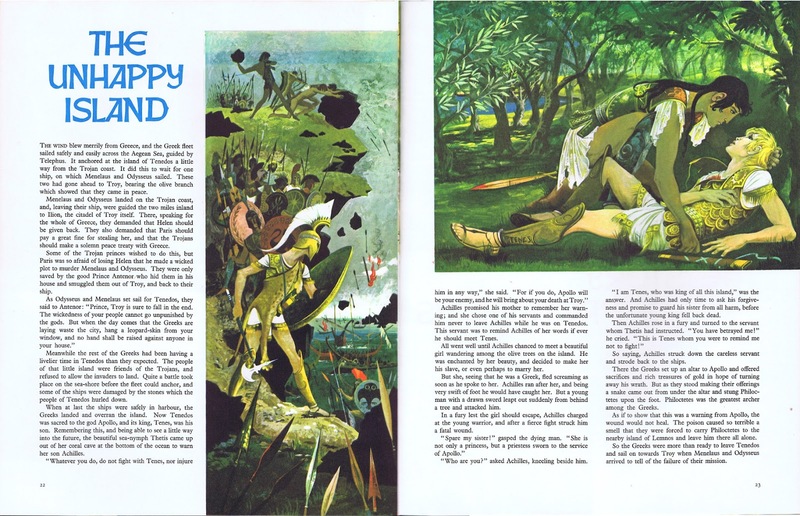 In those far away days when color printing was still something of a luxury, books that boasted a large format and cover to cover color printing were still something of an event. 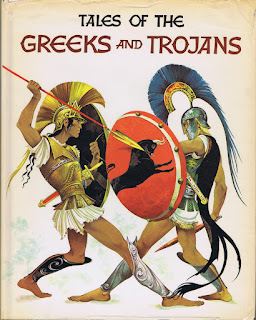 But this book was an even in itself, for the cover with Greek warriors in a duel to the death, their boldly painted forms silhouetted against a white background was an introduction to the work of one of the most extraordinary illustrator teams I have ever come across. Anne and Janet Grahame Johnstone were twin sisters who literally shared every commission they undertook, and by share I mean share as in working on the same artwork, each of the girls bringing their particular skills and interest to the project they were working on, Janet's particular passion was drawing animals, whilst Anne's love of costume was where she devoted much of her energies. Passing each artwork from one to the other they would produce artworks that were literally a combined operation. Born in 1928 and raised in an environment where their artistic prowess was encouraged both at home and at school the sister soon gained recognition as illustrators whose innate sense of form, design and drama (much of it presumably inherited from their mother Doris Zinkeisen who was a noted portraitist and costume designer) was apparent from an early age. 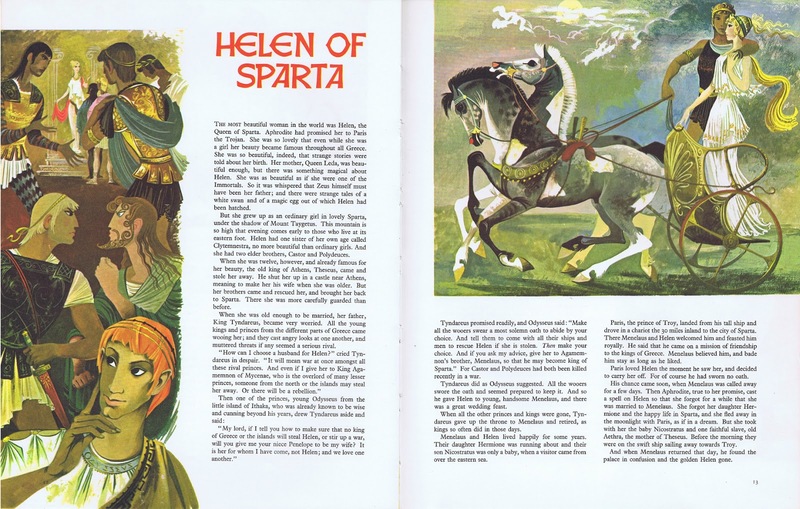 Tales of the Greeks and Trojans, therefore was not their first or most prominent commission, in fact by the time they embarked on this masterpiece, they were well and truly in command of a very successful illustration practice, having provided artwork for Dodie Smith's 101 Dalmations and undertaken commissions as diverse as an updated (1950) version of the 19th nursery horror classic Struwwelpeter and pioneering work for BBC Children's TV on such series as Andy Pandy and Bill and Ben. 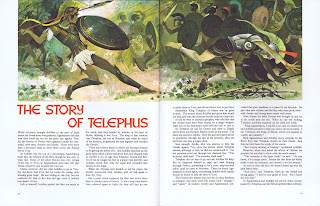 However, Tales of the Greeks and Trojans was for me, by far their best work. 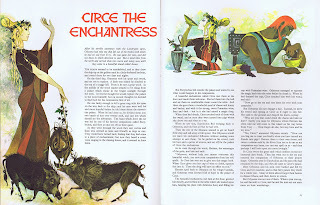 In it's pages you can see many of their influences, with hints of earlier northern European fantasy illustrators such as Kay Nielson, a touch of the stylings of Evind Earle (the man that defined the look for Walt Disney's Sleeping Beauty), the pigs in the Circe illustration faintly reminiscent of the work of Maurice Wilson, but ultimately the artwork is very much the work of Anne and Janet Grahame Johnstone with their superbly orchestrated designs, bold outlines, fabulous costumes and an innate sense that allows them free reign to make each artwork sing with a vigor and life all it's own. 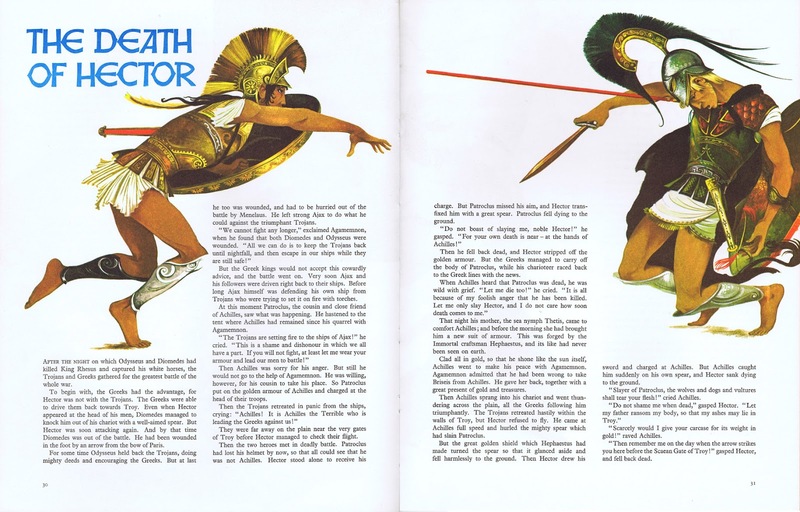 Look at the symbolic use of red in the art depicting the return and subsequent murder of Agamemnon, the way that the well observed variations in skin tones add extra vibrancy to the characters hair and costumes. The way that the forms radiate of the pages creating beautifully realized negative space, in much the same way that the figures depicted on the mycenaean pottery the sisters had so carefully researched do. The use of texture producing yet another layer of storytelling to each amazing spread. Enough of the preamble here's the artwork. As ever our tastes coincide Peter. I too fell in love with 'Tales of the Greeks and Romans' when it was first published and have treasured my copy ever since. But did you know that it was originally commissioned as a weekly series for Purnell's educational magazine 'Finding Out', where it was closely followed by the stories of Sir Lancelot and Jason. Finding Out tends to be remembered today as little more than a poor relation of Look & Learn - in spite of sharing many of the same artists such as Angus McBride, Ron Embleton and Richard Hook - but to my mind the outstanding contributions of the Johnstone sisters gave it a unique appeal all of its own. Amazing, no I didn't know Phil. Needless to say I am now intrigued and will be looking for back issues. More damage to my non existent funds. 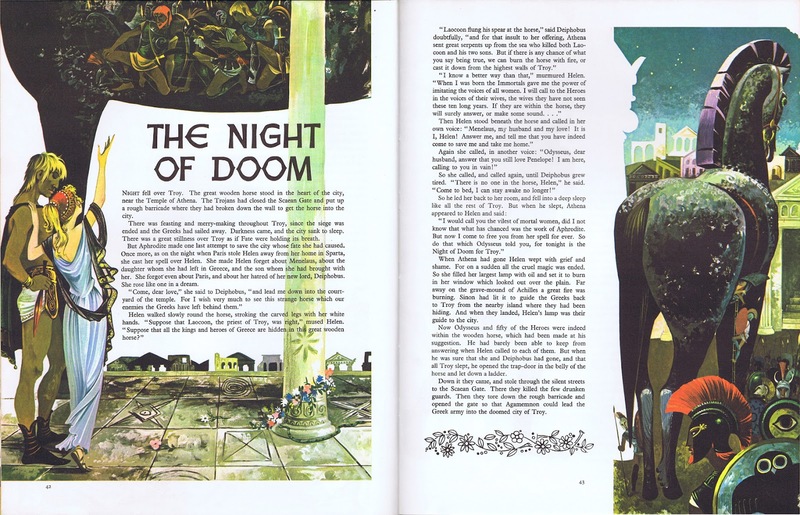 Oddly enough it's only just occurred to me that as Finding Out (which never carried a date) was launched in October 1962, the first episode of 'Tales' in issue no.17 would have been almost exactly contemporaneous with the beginning of Ron Embleton's 'Wrath of the Gods' in January 1963 - just in time for the release of Ray Harryhausen's classic 'Jason and the Argonauts' later that same year. Definitely an 'Annus Mirabilis' for any impressionable youngster with a taste for Greek Mythology! Its amazing that you posted this six days ago! I was obsessed with this book as a child. My Dad was given it as a present when he was five, and I, too, fell in love with it at a similar age. 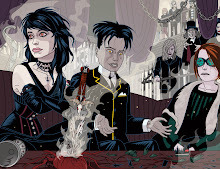 I've been looking for the images from it online on and off for ages, so thank you! A pleasure Ellie, for some reason it is a relatively rare book and seems to command quite high prices and as you say there is a dearth of images from it on the internet. 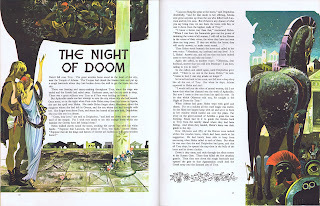 I'll be posting a little more about Anne and Janet Grahame Johnstone on this blog soon. 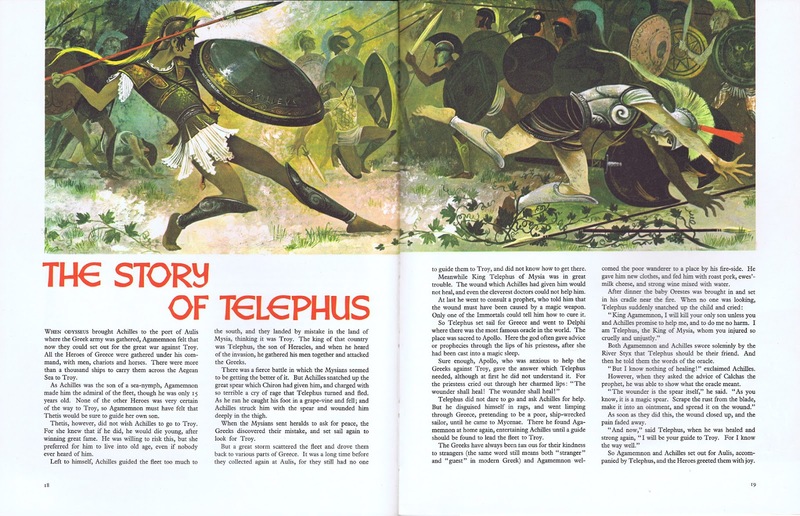 The format for this book was identical to 'Tales of the Greeks and Romans' except that it was issued without a dustjacket. Unfortunately it seems to be just as rare today and is therefore equally expensive. For those interested, our shop has recently listed a copy of this extremely rare book, "Tales of the Greeks and Trojans", on Amazon. It has no dust jacket, but otherwise is in rather good condition - see product listing for further description. This is a book I fell in love with at junior school and copied the illustrations in my own simple way when I was learning to draw. About 1988, I went back to the school to see if they had a copy so I could get the ISBN number and try to track down a copy and they still had it. Battered and stuck together with tons of tape and so on, and they said since it was such an old book and in such disrepair, I could have it!. So, like a loved old school friend it sits on my shelves still. Well don't keep us on tenterhooks - what is the ISBN Number? What a lovely story Wayne - I am so glad you and the book were reunited. 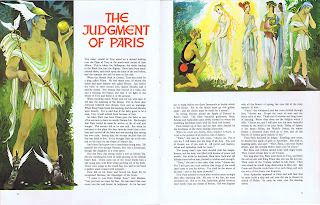 I too discovered this wonderful artwork as a child from the Finding Out series in the 1960's and owned a copy for many years but foolishly lent it out - never returned. I too have been trying to locate another copy. I would be much obliged to anyone lucky enough to hold a copy should they be kind enough to advise the ISBN number to assist my search. Hi, for those interested we are offering an extremely rare copy of this beautiful book for sale on Amazon. This book is hardly ever to be found for sale and is now a real collector's item! Not at £100! I find it quite ironic (and somewhat sad)that a charity is attempting to sell at such an exorbitant price. 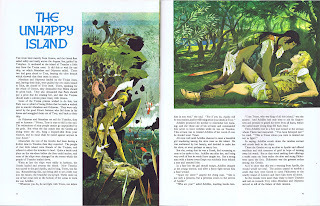 I too adored this book when I was a child and have been searching for it ever since. No luck online until I found your site. Thank you so much for posting these beloved illustrations! 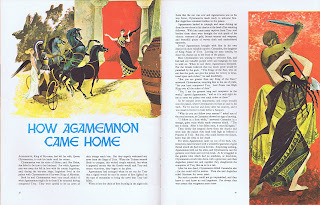 I don't know if I would ever have seen them again otherwise as the book seems impossible to find, (Where have all those original copies gone, I wonder?I kick myself for not hanging on to mine: my first and most treasured images of the Ancient Greeks). A big thank you again. I first came across the stories in Finding Out as a 10 year old and then saw the book when I was in town with my mother. I persuaded her to buy it for me, for 17/6 from memory, and I still have it 53 years later. Slightly worn cover but otherwise in great knick! 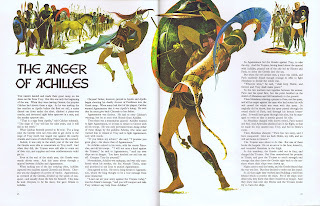 As an artist myself i constantly marvel at the beauty of those wonderful illustrations. It is one of my treasures!